Everyone lives a personal “hero’s journey”. The Bumpy Road shows how culture clash is a muse for creative transformation. 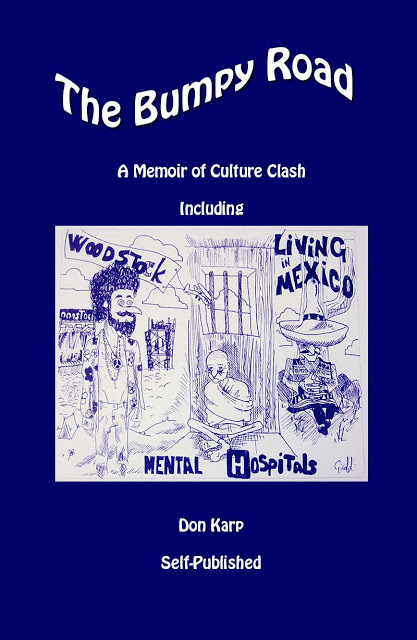 "The Bumpy Road, A Memoir of Culture Clash Including Woodstock, Mental Hospitals, and Living in Mexico"
Everyone lives a personal “hero’s journey”. The Bumpy Road shows how culture clash is a muse for creative transformation. It tells the story of childhood followed by adolescent confusion. A boy struggles to become a man by buying into institutions that did not work for him: marriage to a woman whose entire self-concept was tied to “the relationship”; academia where as a science student success is about publish or perish; the old boy club where lies and back-stabbing were rampant. The 60’s culture came and personal chaos ensued. Relying on mental hospitals to correct these institutional evils created new problems. But the human spirit is resilient. The Bumpy Road details how the habit of going to the hospital for help was broken and how a new artistic identity emerged. Exposure to cultural diversity provided opportunities. New struggles and successes were encountered in Mexico. The Woodstock Festival, Mental Hospitals, and Living in Mexico." 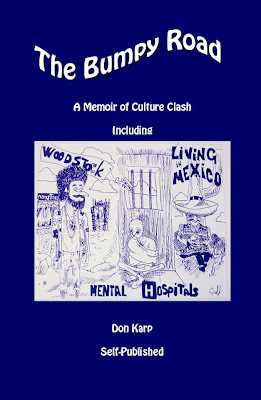 "The Bumpy Road, A Memoir of Culture Clash Including Woodstock, Mental Hospitals, and Living in Mexico"
See my experiences inside and on the outside of Hutchings and other mental hospitals. How did I manage to get out and stay out? How I headed South, and survive well there writing, playing music, and etc. Sunrise Recovery, 1330 E. Washington St.Syracuse, NY. How I transitioned from mainstream aspirations, via sixties alternatives, and membership at Sirius Community for six years, to writing, playing in a band, teaching sacred geometry, and etc, in Mexico during the past 9 years. Since this is a memoir, it records what I have remembered. Others may have experienced what I mention in a different manner. I apologize for any discrepancies, projections, or judgements.